If there’s one person I won’t ever forget during my time in Vietnam, it’s Thủy. 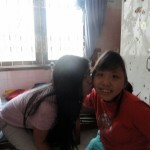 The first day I met her at Từ Dũ Hospital, she welcomed me with open arms. I can never forget her smile, a smile so generous and kind. I remember her asking me quizzical questions about America and about my life; although we had only met for a day, I felt as though I had known her from years ago. But Thủy waslike that; she was full of life and made others feel comfortable in her presence. A few days into my service at Từ Dũ Hospital, our relationship evolved. As I sat in the hospital room helping to fold diapers, Thủy asked me if I had any siblings. I immediately rambled on about my baby brother in the states, a person I missed dearly. Impulsively, I asked her if she had any siblings. Thủy laid her head down with only a small smile perched on her lips. She quietly said no. She told me that she was okay with it and that she didn’t get lonely. I sensed sadness in her voice and realized that my question was too sudden, too intrusive. In an attempt to lighten up the mood, I nudged her and said that I had always wanted a younger sister. Then I pulled out the question: Thủy, would you like to be my younger sister? Her eyes lit up, and her lips curved into a smile. She asked me excitedly if I were serious, if I really wanted to be her older sister. I nodded and smiled. Chị Trâm thân yêu! Chúc chị đi về Mỹ bình an và có nhiều đìều may mắn trong cuộc sống. Và nhũng điều chị mong ứơc sẽ thành hiện thật, chị gái của em! Dearest Sister Tram! I wish you a safe flight back to America and that lots of lucky things will come to you in life. And I hope that all your dreams will be fulfilled and become reality, my sister! Even miles from her and Từ Dũ Hospital, Thủy and I still talk everyday. When Thủy is sad or happy, she calls me. Sometimes she calls just to say she misses me. A pang of guilt always hits me as I realize how much our relationship means to her. Due to the hustle and bustle of the fellowship, I often forget that I need to be there for her. I know that our ten-minute phone conversations mean the world to Thủy. But this is something I should have realized long ago. On my last day at Từ Dũ Hospital, Tran, a volunteer at Peace Village, relayed to me Thủy’s story. Tran was talking to Thủy one day about her family. Thủy suddenly cried. She cried in longing for her mother; Thủy said her only dream in life was to meet her mother. For a girl who gives me all her love, I’ve realized how truly unqualified I am in holding the title as her older sister. 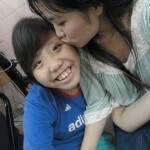 When I promised Thủy that I would be her sister, I didn’t realize the responsibility it entailed. I became her family. Thủy is often sad when I am unable to talk on the phone. And when I finally fly away from Saigon in that plane, where will we be? But the thing is—Thủy, Thủy is so selfless. She is happy just to hear my voice; she asks for nothing else. Sometimes she just needs a friend, a sister who she knows is there to care for her. I find myself sitting and asking what on earth I ever did to deserve her love. This person who was a stranger to me two weeks ago now treats me like family. I abruptly flew back to Saigon a week ago for the weekend. 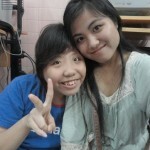 I visited Từ Dũ Hospital again, and Thủy ran up to me with a huge bear hug. In her hands laid a phone chain she had bought. She whispered in my ears: “This is for you sister. I bought us matching ones. I missed you so much.” I walked into the hospital with nothing, no gifts on hand; but for Thủy, just seeing me had made her day. And that, to me, is the greatest gift she has given me. I’ve realized how special our relationship is. I want her to know that I am always thinking about her. I want her to know that if she is sad or lonely, she has me. The miles and the distance cannot limit all we have. I cannot be there for her everyday, but this fellowship has taught me that there are many other avenues I can take to protect her. I’m always thinking of you, em gái. Thank you for all you have given me. I’m always so proud of you. A beautiful story, beautifully told. I do wonder why Thuy was in the hospital and for how long? And what happened to her family?